I am really a beginner in the hobby, but I have some experience with small quad copters and some cheap normal helicopters. I love the idea of a multi-rotor, but I can't afford a very good one. 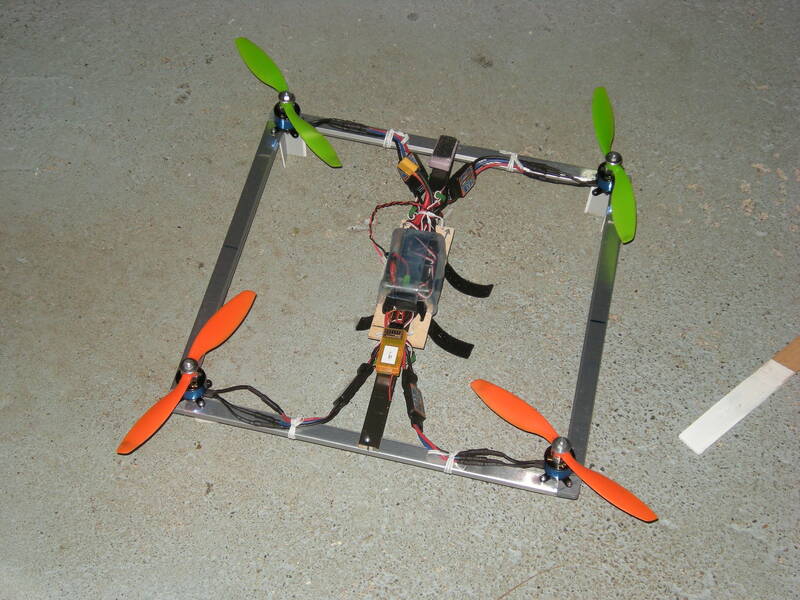 So I want flite test or someone else to design a cheap, durable tri-copter OR Quad copter. One that is powerful enough to carry a camera/FPV but still is affordable, aka $100 or less. Hopefully this will be taken as a challenge. Isn't that what the Anycopter platform is? This setup should weight about 800 grams and be able to take on an additional 200-300 grams in FPV equipment. That's $87.54 plus shipping. Go to the local hardware store and pick up two 36" long 1/2" square wood dowels for <$2 each, around 16 M3x20mm screws and nuts, four 2" wood screws, a pack of 4" zip ties, and some velcro. From a hobby store get some arts/crafts plywood square or rectangle shaped larger than the flight controller's foot print. Cut two lengths of 11" square dowels for motor booms and cut two lengths of 9" square dowels for support booms. Make a I/H layout with the dowels and use the 2" wood screws to hold the frame together at the top of each intersection. Space the support booms far enough apart for them to side on the widest part of the plywood which the flight controller and ESC will mount on top of. Mount the motors directly to the ends of the booms. Use velcro to mount the battery under the plywood piece. You still need a battery charger, transmitter, receiver, male/male servo jumps for the receiver to the flight controller, plus tools like a drill, soldering iron, a saw of sorts, screw drivers, and wire cutters. Keep in mind there are a number of short cuts made here; it will work, but it probably will not be an ideal FPV/aerial photography platform. The Anycopter is $59.00, not including electronics, so I am guessing it is over a hundred dollars. Thanks Mustang7302, I appreciate it, I might do that, I do have all the needed tools. The Anycopter can be much cheaper if you have the tools. the knuckle is easier to scratch build though. Any tips on flying a Quad Copter? I've had some practice with a Nano-QX but that's not exactly a 200 gram multi-copter. By the way, I'm just a kid, so please keep it simple, I don't know everything. I built a quad that was constructed out of aluminum window screen frame. I affectionately call it "Screeny". I think the screen frame material was $3 and the corners were another $3. To keep the frame from crushing where I joined the square to the cross bar, I cut a piece of wood and slid it inside the frame. I've flown it dozens of times and landed pretty hard on a couple of occasions, and it has withstood the abuse. It has plenty of lift to support FPV. Sorry, Gector. What I meant was that if you have the tools, you can make the copter out of light ply for the frame and 1/2" square wood dowels. Might run around $10-15 for the frame that way. You'll still need to source the hardware and electronics but the frame is super easy to make on the cheap.